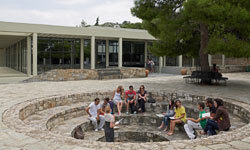 Earn up to 6 credits through a wide variety of courses when you study with AIFS in Athens, Greece. You may choose to Live in a shared double room in the apartment-style residences. Enjoy cultural activities such as guided city walks, visits to historical and archaeological sites, and Greek dancing and cooking classes, and day trips to Hydra and Cape Sounion. Optional excursions include a 4-day tour of Rome, and day trips to Corinth, Nafplio and Epidaurus, and Delphi and Arachova.